Landscape lighting is one of my favorite parts of the landscape. This may seem like an odd comment coming from a horticulture graduate, but it is true. There is something about landscape lighting that finishes the look of a professional landscape if it is done right. This is especially important for anyone who works 8-5 because it extends the enjoyment of your landscape to the hours that you are home. In the winter, it is dark by the time I come home and make supper. I love to stare out the window while I do dishes but there is not much to see if it is dark and there are no landscape lights. The design possibilities with outdoor lighting are endless. The design dictates where one’s eyes go. If I add lighting to the landscape beds they will steal all the attention and leave the trees nearby hidden in the dark. If I did the opposite, light the trees and not the landscape beds, then the trees will show off their beauty while the landscape bed is simply ignored. With lighting, I have the ability to showcase pieces of the landscape that normally go unnoticed. For example, I may up light a redbud tree or weeping mulberry to show off its twisted branch structure. Next I may use some dim path lights to light up the walkway from the porch to the garage. I would give it enough light to help guests find the door, but less than the tree so while they safely walk to the door they admire the beauty of the tree that they never noticed in the daylight. Adding the dimension of various intensities of light as mentioned in this scenario makes the landscape so much more wonderful and the design more exciting to make. One of the most tempting mistakes that can be made with outdoor lighting is too much light. If you spend very much time in a nice neighborhood in a city, you will find some houses that are lit up so brightly you are convinced that it is daytime. The goal of lighting is not to light up the whole yard but to add little pops of color to an otherwise dark world. It can be a challenge to decide upon a single feature to be the focal point and leave so many other beautiful plants and structures hidden in the background, but it is necessary. 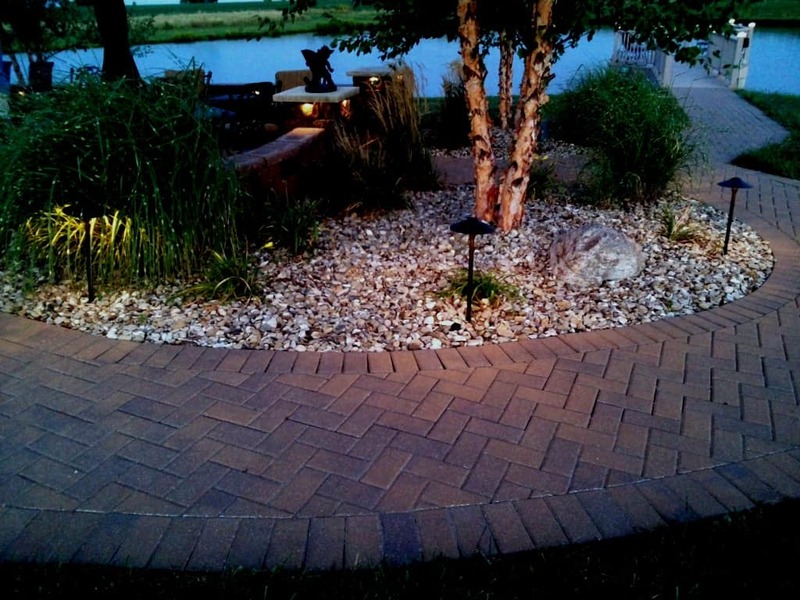 The best landscape lighting gives off soft glows of light that draw one to the house. They give an idea of the surroundings but leave the vast majority to be filled in by one’s imagination. This is the charm and draw of landscape lighting. There are many different techniques and types of lighting that can be used that I will explain next week. They include up lighting, down lighting, path lighting, under water lights, post lights, wall lights, and stair lights. The combination of several types of lights with different intensities, on structures and plant material is what makes each landscape lighting design unique!